One of the best things about our awesome Flytographers all over the globe is that they’re all experts on the top things to eat, see and do in their cities! We tapped Emma, Sonya and Alberto, Flytographers in Florence, for their favourite picks for first-timers to their beautiful city. 1. Eat lunch inside Sant’Ambrogio market with the locals. For a true local experience (one that Emma doesn’t dare partake in herself), she recommends trying a lampredotto sandwich, a classic Florentine dish made of slow-cooked tripe. Or try Mercato Centrale for another authentic local market eatery. Looking for tapas? For Florentine comfort food, try Reale Firenze. Maybe pizza? Head to Berbere. Grab a slice with a craft brew and settle in for the night. 2. Enjoy views from the top. For the best views of Florence, climb the Duomo or Giotto’s Bell Tower. 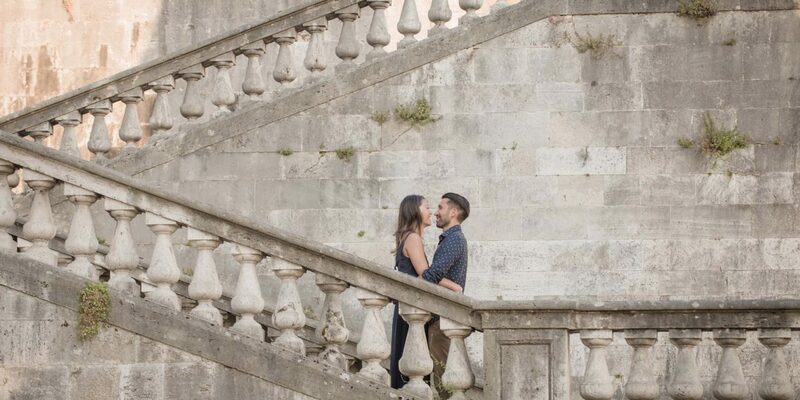 Flytographer Alberto recommends heading to San Miniato al Monte, one of the highest points in the city. And if you’re afraid of heights, take a tip from Amy in London and use it as an opportunity to conquer your fear with an amazing reward at the end. 3. Experience classic Florence. Walk from Piazzale Michelangelo, where you’ll be treated to panoramic views of the city, to the Arno River and the Ponte Vecchio, a medieval stone bridge perfect for a romantic evening stroll. 4. Have a glass of red wine. Just behind the Duomo lies a cozy nook perfect for enjoying a glass of Italian red. Il Vinaino is just a five-minute walk from Florence’s main train station, so it’s the perfect place for a welcome drink and bite to eat upon arrival to Florence. 5. Visit the Uffizi Gallery to see classic works of Italian Renaissance art. Buy your tickets in advance online to avoid waiting in line. If the weather is nice, enjoy a picnic inside Boboli Garden, just a ten-minute walk across the bridge. 6. Visit the artisan shops. Check out the shops hawking local specialties like Florentine paper and leather. Check out Alberto Cozzi’s shop for beautiful marbled paper and hand-bound notebooks. 7. Enjoy an Italian coffee. Head to Ditta Artiginale, suggested by Flytographer Sonya, for legit Italian coffee. Have a strong one while you’re in town and enjoy! 8. While you’re at it, enjoy an after dinner drink. Cap it off with an Italian aperitivo. Try Mezzo Litro for an after-dinner night cap, and order a Negroni or Spritz. Neither will disappoint. 9. Enjoy late-night eats. If you’re craving after-dinner bites, head to Drogheria Bar & Grill for late-night Italian goodies. 10. And for the ultimate Italiano night cap? Gelato. You can’t go wrong with Badiani. They’ve been around since the 1930s and they know what they’re doing. Trust us.